The small 150-seat church, often referred to as a ‘starter-church’, was never intended to be a full-service building, but originally was an auxiliary building for the local First Congregational Church which was then located in downtown Appleton. Their downtown building was called “The Old Brown Church”. In 1888, before the days of the automobile or the availability of mass transportation, the easily accessible neighborhood meeting place made it easier for young families to walk to church in the event of inclement weather, or even the threat of wild animals. It also eased space needs for a congregation during the days of the fast-growing Sunday School movement. Once vacated by the Congregational Church in 1912, It served as a transitional building for several other religious organizations. 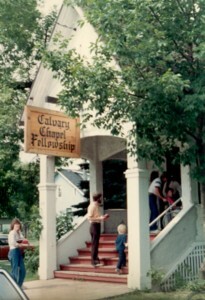 Calvary Chapel leased the cozy structure in the late 1970s and did some painting and upgrading to meet city codes. For the first two years, we met on Tuesday and Friday evenings for Bible Study. Sunday services began in July of 1981, and we soon found ourselves having 2 services – with the first group of fellowship-hungry worshipers having to exit very quickly to accommodate the later group. This was a difficult transition for our small fellowship initially, having been used to getting together as one each time we met, and now feeling a bit fragmented as we struggled with the inevitable to accommodate our growth. Although we knew that changes were unavoidable, and that staying for both services would defeat the purpose, there were times we could not help but wonder if the worship was maybe a bit sweeter at the ‘other’ service, or perhaps we could use another helping of the Word before our week got underway. But our one claim to fame in that building is that we were the only fellowship to have ever filled it to capacity. The Sunday School was located in the tiny basement where curtains partitioned the single room into 4 separate noisy but joy-filled classrooms. At the same time we recognized our need for a Sunday School for the children, the Appleton Public Library was moving to their new building from their old site on North Oneida Street. They were holding an auction to get rid of a lot of their oak tables and bookshelves, and Pastor Dwight decided we would be attending that auction to acquire some much-needed pint-sized furniture. In a staff meeting he indicated that not only would we be acquiring the tables, but that we would not spend over $90.00 to meet the need. The Saturday of the auction, on an unusually hot spring day, we acquired every item we set out to, within a relatively short time, and for –$90.00! The Lord had once again shown Himself strong to a group of relatively young believers. The ‘Little White Church’ was drafty in winter and stuffy in summer, but the acoustics were delightful and the fast-growing group of young believers was content to simply learn more of Jesus and grow in the grace and knowledge of Him. There is something so irreplaceably memorable and priceless to those who find themselves a part of the start of something that is simply born out of a deep desire to love and serve Christ and fed by the zeal of a heart that has been transformed, not born out of man’s might or fed by a program, no matter how well-intentioned. The early days of Calvary Chapel could not have been sweeter, nor could they have been the result of the latest demographics, or the latest postmodern winds of change.